UPDATE: Rik Penny from Ripe Digital took care of all the print for the funeral. I was overwhelmed with the quality, professionalism and kindness they showed me and can wholeheartedly recommend them for any print work. Note. I’m not looking for freebies whatsoever, I just don’t know the best way of getting them printed. Lots and lots of people kindly tweeted condolences, messages of hope and offers of help to me last week, after I suddenly lost my Mum on Wednesday. There’s never anything anyone can do or say in these situations to help ease the immense heartache and pain you’re feeling – only time heals that I’m sure, however, there are a lot of logistical things I’m struggling with, and I wonder if anyone can help. 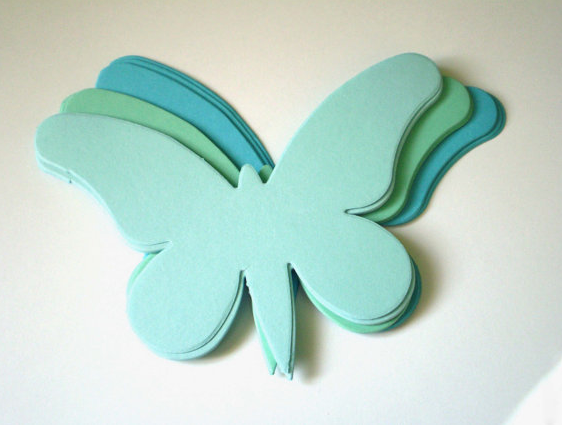 I need to lay my hands on 200 card butterflies, in exactly the colours shown in this photograph plus maybe a magenta. There’s lots of cut-outs or hole-punch type things, but they are meant for scrapbooking and far too small. These need to be around 15cm wide. Mum worked in a school (as the school nurse) and they are all missing her greatly. I want to get all the children to either write Mum a message, or draw her a picture, then we’re going to stick them all over that horrible “box” one has to go into (I still can’t say the “c” word, yet), to take the sting out of that visual for all of us on the day we’re all dreading. Anyone know the best way to achieve this? I know die-cutting is an option but with 4 colours, I think it’s going to get super expensive? Any help greatly appreciated. Previous Post Spec work & how to make my blood boil.